With Christmas coming up I'm getting presents left and right. I'm almost done! I'm just waiting on my parents to tell me what they want. 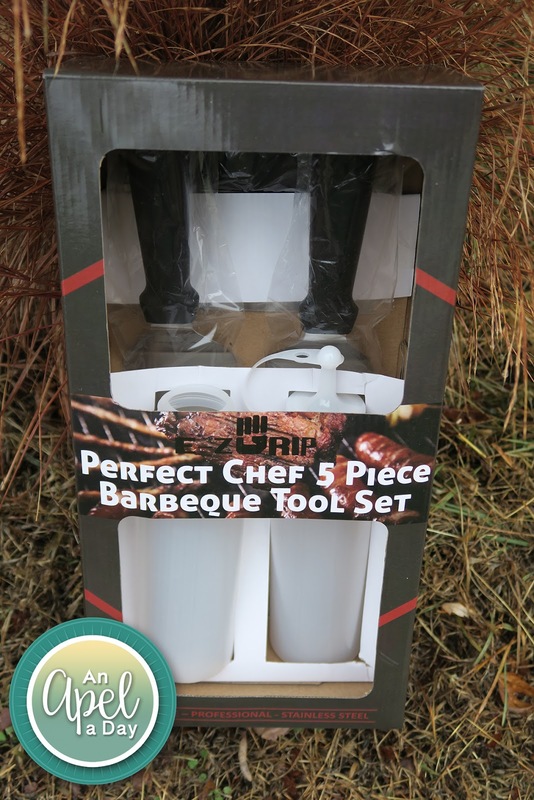 One of my favorite presents is for my husband: E-Z Grip BBQ and Grill Accessory Kit. It's not gigantic, but something I know he'll use. I always struggle with what to get the adult males in my life. My Dad isn't into sports, hunting, or fishing. He's more of a gardener, artistic type. Travis has lots of hobbys and loves art, but I never know what he has. He is like my Dad, and gets into gardening. He's different than him when it comes to cooking and grilling. He loves to make meals! I could see us using the bottles for homemade sauces and possibly dressings. Most of our grilled meat we marinate. I love that the containers are BPA free. I do always wonder about the checmicals that are used in plastics when they are BPA free. I did have a little problem: One of my bottles came without a lid. The chopper is great for cutting things in 1/2 like burgers and corn on the cob. I know I'll also use it for scraping flour off the counter when I make roll out cookies. I like the spatula with the holes for burgers and sausages. The grease can drip off. Both spatulas will come in handy. 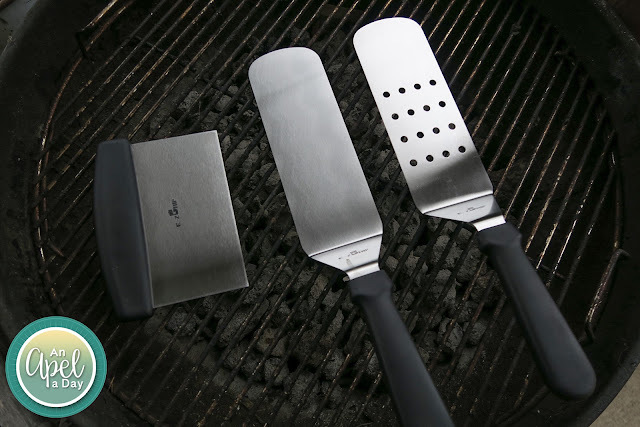 They have great grip handles, which is important around a hot grill. The box is perfect for being wrapped. Everything is dishwasher safe. Super easy to clean! We like to grill burgers the most. What do you like to throw on the grill? Disclaimer: I got this product for a discount in exchange for an honest review. Everything in this post is written by me. This is a nice bbq set! I usually do mushroom burgers these days, but I still make Jason and Mariah the occasional burger or pork chop on the grill.